The question is this: is it as good as the C-5060? 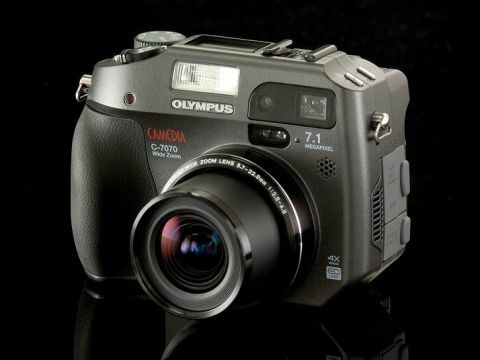 The stunning Olympus C-5060 Wide Zoom has proved quite a hit with the camera-buying public over the past year. Its performance and convenience means it has made its way onto the shortlist of many a serious photographer who wants a compact with near-SLR performance. Building on this success, Olympus has now launched a 7.1Mp version that it hopes will undercut the budget SLR cameras on the market without compromising on quality. To do this Olympus has started out with what it knows best - optical quality. At the heart of the C-7070 is a bright zoom lens that offers a superb 27-110mm optical zoom range. The lens itself is a luxuriant, multi-coated, all-glass affair that opens up to f2.8 at its widest setting. Olympus has paired its heavy-duty piece of glassware with a capable 1/1.8-inch CCD sensor which should help to reduce noise levels. Sensors of this size could soon be a thing of the past as current trends head towards further miniturization, and that may lead to increased problems with image noise. Perhaps you'd better think about buying bigger before they disappear from shelves forever. As far as resolution goes, the 7.1Mp CCD provides images of 3,072x2,304 pixels and you can choose to save the image as a RAW, TIFF or JPEG file. You can also choose the compression level of JPEG and you can opt for a 3:2 image ratio if you want to preserve your composition in order to get your photos printed at a high-street mini-lab. To view the high-res images that such a sensor/lens combination produces, you need a fairly special LCD screen. And it's here that Olympus has done some of its best work. Although the 1.8-inch screen isn't particularly large, its image quality has been enhanced to make it easier to view in sunlight. Not only that, the ingenious design enables it to flip through 180 degrees while twisting around its axis by 275 degrees. That means you can use the screen as a waist-level viewfinder or an overhead viewing scope. It's equally useful for flipping up and twisting around to show someone sat opposite you the image you've just shot. The more vain will also note that the arrangement is just perfect for shooting self-portraits. And once you've used the rotating LCD you'll really wonder how you ever managed with the ordinary static variety. And for those who prefer to use the built-in optical viewfinder the screen can be twisted around and stowed away. That should save on power and provides protection for the screen. Since we're on the subject of power, the Olympus Lithium-Ion battery is a real workhorse. Olympus doesn't quote a battery life in terms of number of shots, but take it from us that the C-7070 has more stamina than a Duracell bunny. Buy a spare and you'll never, ever run out of juice - even during a heavy day's shooting. The body of the C-7070 WZ is wrought from magnesium but the light metallic finish gives it a rather plastic look. Because of this it doesn't look quite as robust as the hammered metal finish of the Olympus C-5060. Even so, it's a squat little beast of a camera that has a snub-nosed quality in a dogged dreadnought sort of way. This is the ideal camera for travelling. It's rugged, reasonably small and yet has a wide-angle lens that few other compacts can rival. A lens that has the equivalent of a 27mm wide-angle will cause a few issues with barrel distortion. Frankly though, we'd defy anyone to show us any digital camera lens at that focal length that doesn't cause even the straightest wall to bow inelegantly outwards. You can of course correct such optical handicaps with the use of Photoshop, but you soon learn to live with it and you can always turn on the grid display to help you keep things on an even keel. Starting the C-7070 from cold takes one to two seconds. It's fast but when you really need to catch that one-off shot it can seem like a lifetime. Shutter lag is virtually absent and we found no real cause for complaint there at all. The only way you could reduce the lag would be to buy yourself a digital SLR - but then you'd have all that bulk to carry around, wouldn't you? Shooting modes are as extensive as you'd want. There's a choice of fully automatic program mode, which includes program shift where you can alter the aperture or shutter without shifting the exposure. So, for instance, you've got 1/125th at f8 and decide that you want to crank up to 1/250th - the aperture automatically adjusts down to f5.6 in order to keep the same exposure. The other exposure modes are aperture priority, shutter priority and manual. Changing values is simply a case of turning a knurled thumbwheel. It's all very instinctive to use and a joy once you're shooting. In addition to those regular modes, there are eight special settings that include an underwater mode. Olympus makes a great range of underwater housings and the C-7070 WZ would make the perfect diving companion because of its shape, great lens and that useful sub-aqua mode. The C-7070 WZ can also take movie clips that it saves in QuickTime format. Its shape isn't ideally suited to movie use, but the facility is there if you need it - and you will. All these features are, of course, excellent but no less than we've come to expect from Olympus. However, what makes this camera a real joy to use is the layout of the controls. Every function you need to access in a hurry has it's own button. For instance, if you want to change the exposure or you need to shift from macro to super-macro then it's possible at the touch of a button (in conjunction with that handy thumbwheel) to switch. What's more, if you're not using the colour screen you can still monitor the status of all those settings by using the small LCD panel built in to the top of the camera. Things you need to keep track of like aperture and shutter, battery life and which metering mode you're using are all there for you at a glance. Next to that small LCD panel is a hot-shoe for the range of Olympus flashguns. These really are very good flashes and the days of ghosted-out flash shots are a thing of a past. The bad news is that all the Olympus flashguns are pretty expensive, but it's hard to get good flash shots without one. You can always use the built-in flash, but the range is limited and the perennial red-eye problem will never be too far away. Finally we ought to mention the updated firmware that features on the C-7070. Gone are the toy-town graphics of earlier Olympus models; there are now smart 3D effects and all the menu settings are managed via a four-button cluster and a central menu button. Included in the extensive on-screen menus is a pixel mapping feature that enables the firmware to check your camera's sensor for dud pixels and map them out by substituting the value with that of a neighbouring pixel. As far as we know, Olympus is the only camera maker to offer this facility - that's a shame as it should be standard on all digital cameras. Now we come to image quality and we're pleased to report that, in common with its predecessor, the C-7070 WZ turns out some silky smooth images that are, almost without exception, perfectly exposed on every occasion. Focus is good and sharpness fine. But for those who take a lot of action shots there's the new Olympus Oracle focus mode. This predicts (Oracle - geddit?) the focus setting based on the speed of the subject you are shooting. Macro distances are also good, right the way down to stunningly close 3cm. Colour reproduction is spot on with just enough saturation to give images punch but not so much that they look overcooked. In fact, it's hard to fault the photos the C-7070 WZ turns out. If we have one minor criticism it's the way the wide lens can make a shot appear a bit milky if the light catches its surface at the wrong angle. Handling is (as we've already pointed out) a real dream. This is a camera that you soon feel at one with. In terms of functions or features there are perhaps two weaknesses. The first is a lack of longer telephoto. After a couple of weeks' intensive use, the absence of a maximum 135mm zoom made itself felt. However, what you lose at one end of the spectrum you gain at the other - the 27mm wide-angle proved just perfect for landscape photography and gave photos a beautifully wide and airy quality. Our one other gripe is the lack of a PC sync socket for studio flash photography. There's no excuse for this, although even the Nikon D70 and the Canon EOS 350D lack this feature. But if the plucky little Casio Exilim Pro 600 and 700 can offer a sync socket then the Olympus jolly well ought to.